What does the term “enemy alien” or “alien” mean? In the most basic sense, alien means someone who is not a citizen of the US. An “enemy alien” is someone who is a subject or citizen of a country at war with the US. 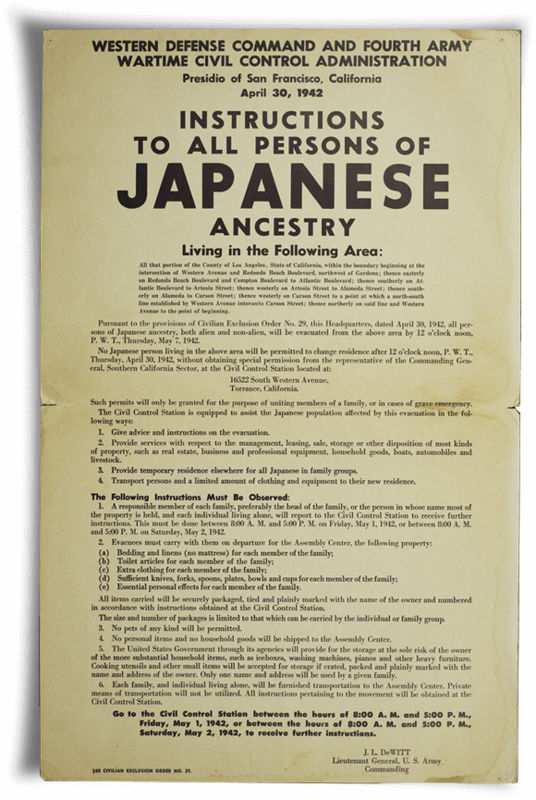 Gihachi was an “alien” not by choice, but because at the time, US law placed racial restrictions on who could and could not apply for citizenship. His children were born in the US and were citizens by birthright. Santa Anita is a town just east of Los Angeles, and the home of the famous Santa Anita racetrack. The assembly centers were temporary, and used until the permanent War Relocation Authority concentration camps were ready to be used. So, all of the assembly centers were created in existing facilities, like race tracks and fair grounds. Existing buildings were used for housing as well. Not everyone at Santa Anita lived in horse stables, but many people did. Owens Valley is in Inyo County in east-central California. This is the area where Manzanar assembly center, then concentration camp, was located. 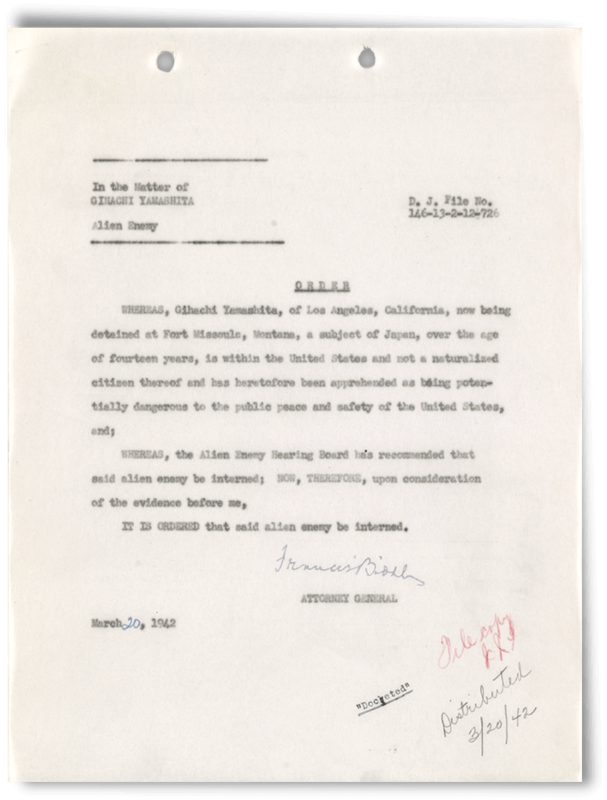 All letters to and from internees in the Department of Justice camps had to be inspected by censors. Staff was available to inspect English-language letters, but there were very few people available who could read Japanese well enough to inspect Japanese-language letters. 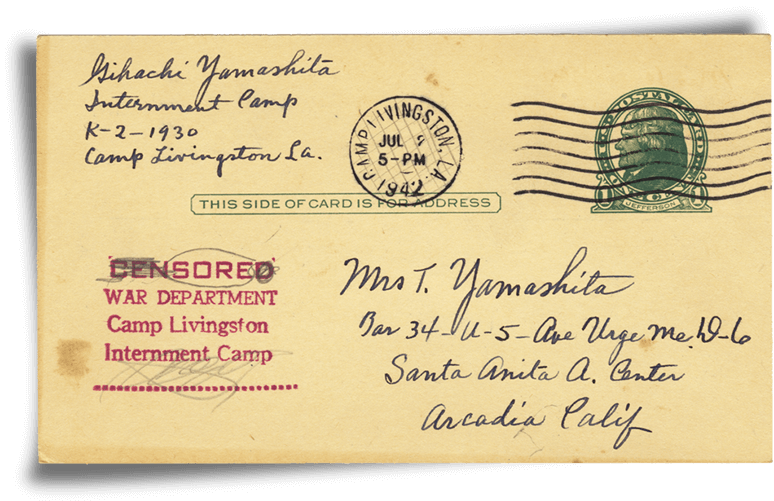 When the Japanese-language censor wasn’t available in the camp, letters had to be sent to New York where censors there would evaluate them. 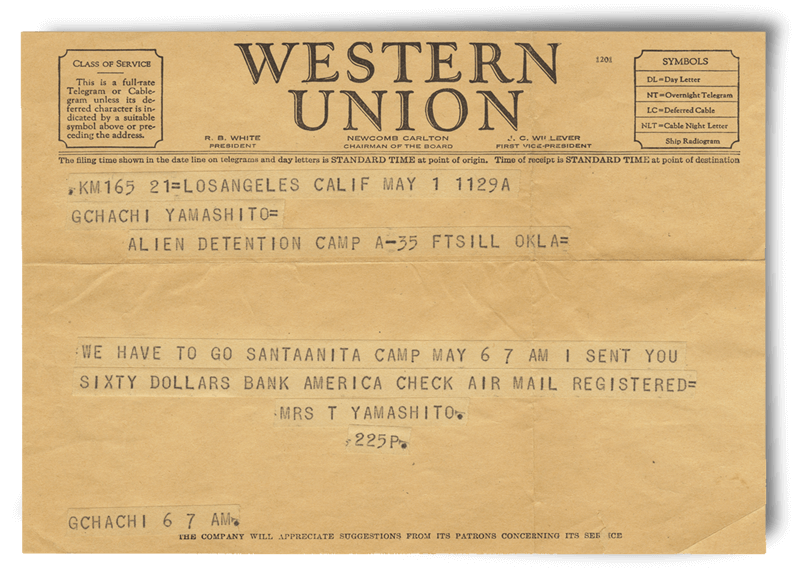 Internees were only allowed to send out a few letters in Japanese. Sometimes they were asked to stop writing for a while so the censor could catch up. This meant that letters in Japanese were delayed. It was much easier for Gihachi and Tsugio to communicate in Japanese, but sometimes the wait made it impractical. All of the mail in and out of the Department of Justice camps were inspected to make sure certain kinds of information were not contained. Anything considered inappropriate was usually cut out—literally—which is why some letters have holes in them. It is not always obvious why something was considered inappropriate. In general, however, any information about where internees were about to go, or names of other people about to be paroled, were removed. February 26, 1942, Letter from Gihachi to Lillian, written in English. There are all kinds of rumors that, sooner or later all Japanese people have to move inland. You and Mom better have that in mind. March 7, 1942, Letter from Gihachi to Tsugio, written in English. But I advise you that when you are ready to move you better wait till the U.S. order to move come to you, and move with people to the same places wherever it be. P.S. Please send me my passport, and Alien Registration card by register mail at once. March 10, 1942, Letter from Gihachi to Tsugio, written in English. I guess the authority never will force you to move while you have no place to go yet. So be calm and peace in mind and depend on U.S. government. March 24, 1942, Letter from Gihachi to Tsugio, written in English. The paper said that lots of Japanese people are moving toward inland volunteerly. I think it is better for you too that you move to Salt Lake City spontaneously. Anyway I hope I be released and be send to place where you will be moved. May 3, 1942 Diary entry by Gihachi, translated from Japanese. Receive telegram from wife saying they are moving to Santa Anita. The day has finally arrived. My wife and children will now also be subjected to this hardship. They will have to say farewell to the house on San Julian we had long grown accustomed to. April 7, 1942, Diary entry by Gihachi, translated from Japanese. 346 of us have received notices that we will be again transferred to some unknown place. April 9, 1942, Letter from Gihachi to Angela, written in English. I am anxious to get letter from you from Owens Valley or Salt Lake City. Anyway I hope you go to safer place too. April 10, 1942, Diary entry by Gihachi, translated from Japanese. When we went beyond the fence, we were assembled in alphabetical order, and since I am a “Y” I was put in the last group. My hand luggage only included things like a towel, toothbrush, hat. At the recreation hall there was a simple luggage search, and my fingerprints were taken again. 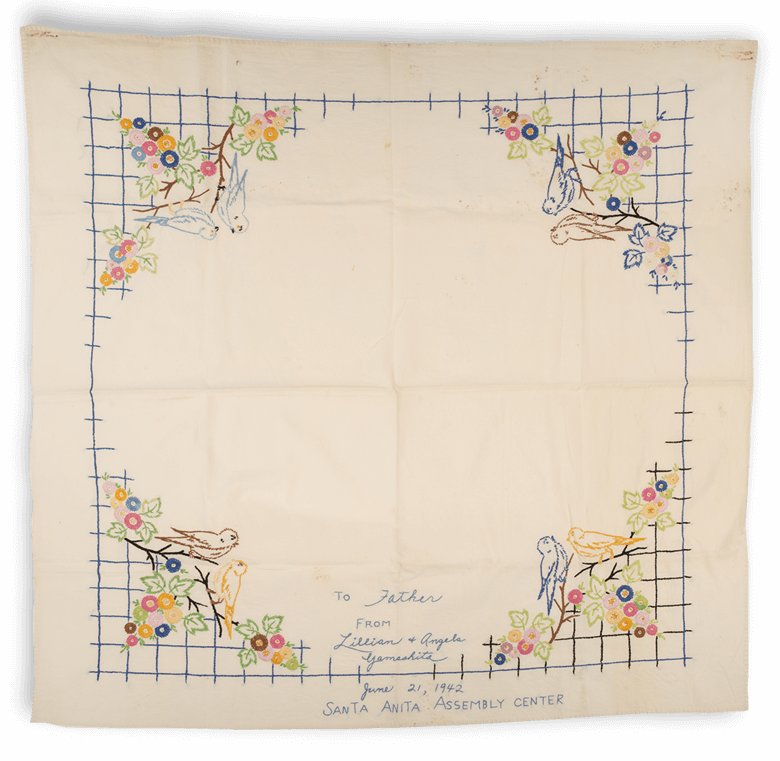 May 4, 1942, Letter from Gihachi to Tsugio, Lillian, and Angela; written in English. May 28, 1942, Letter from Gihachi to Tsugio, written in English. I am not going, I rather stay in this country closer with you & family and like to have communication. We are going to move again to some place now so don’t write until I let you know from new place and don’t write me in Japanese any more as I never got your Japanese writing written letter yet. June 22, 1942, Letter from Gihachi to Angela, written in English. I don’t know how I thanks for the pretty embroidery which is surprised me in fact. I received it on 19th at the office and is opened by inspectors; not only 3 inspector in the office but many office workers and bystanders who saw the cloth are amazed for its wonderful work. Lots people envy me that I have nice children. I am sure I will keep it for forever for memory. August 29, 1942, Letter from Gihachi to Lillian and Angela, written in English. According to Yetsuko letter you will move to unknown relocation center between 9-20 – 10-6. It is true more little animal & insects in Arkansas than Calif because there rain more than Calif but I rather you come to Arkansas because of not only close to me but you have a chance to study the nature & insects. Oct 19, 1942, Letter from Gihachi to Angela, written in English. I have received your 2nd letter from Rohwer & glad to hear all of you are well. Especially I am glad to see the sketch of barrack which Lillian drawn. The sketch were drawn so good and lots people urge me to put up the sketch in some place so more people like to see so I put up it in the mess hall one whole day and more people have learned what the barrack and room look like. April 14, 1943, Letter from Gihachi to Tsugio, translated from Japanese. Whenever one of my letters arrives, please tell me that the letter of what month and day has arrived. I have copies of all of my letters. May 25, 1943, Letter from Gihachi to Tsugio, Lillian, and Angela, translated from Japanese. I am not allowed to let you know where I am going yet but the place a large group of us is going to is quite far away. Let’s both be strong and try not to worry. No matter where we go, as long as it is in the American interior, we won’t be far [from each other]. If we are patient we will eventually be able to see each other again, so let’s take care of ourselves. Order to have Gihachi interned. Embroidered cloth Lillian and Angela made as a Father’s Day gift for Gihachi. 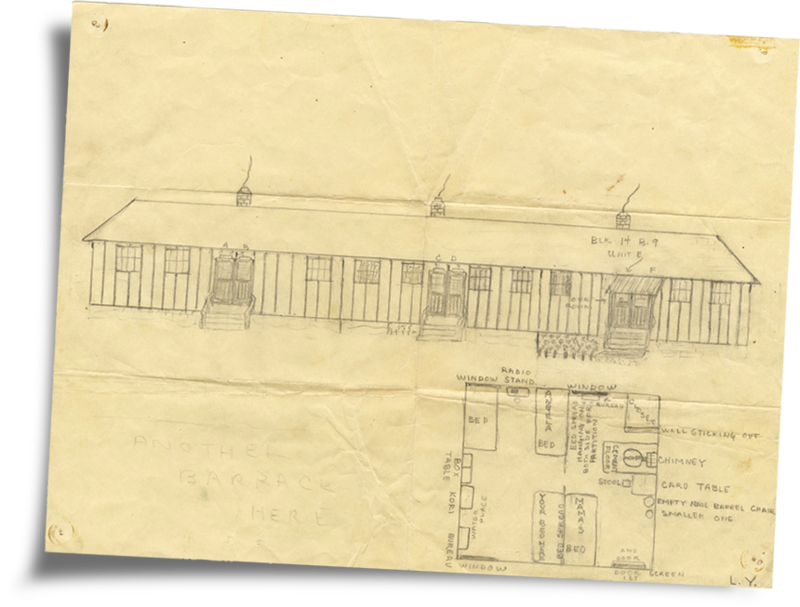 Sketch and floorpan of barracks assigned to Tsugio, Lillian, and Angela that Lillian drew. Letter Gihachi sent to Tsugio from Camp Livingston, Louisiana.